History shows that superintelligence – a technology more intelligent than any human being – is fast approaching. What fundamentally sets us apart from the beasts of the field? Well, the main difference between human beings and animals is our capacity for abstract thinking paired with the ability to communicate and accumulate information. In essence, our superior intelligence propelled us to the top. So what would the emergence of a new species, intellectually superior to humans, mean for the world? First we’ll need to review a bit of history. For instance, did you know that the pace of major revolutions in technology has been increasing over time? For example, improving at the snail’s pace of a few hundred thousand years ago, human technology would have needed one million years to become economically productive enough to sustain the lives of an additional million people. This number dropped to two centuries during the Agricultural Revolution in 5,000 BC. And in our post-Industrial Revolution era it shrunk to a mere 90 minutes. A technological advancement like the advent of superintelligent machines would mean radical change for the world as we know it. But where does technology stand at present? We have already been able to create machines that have the capacity to learn and reason using information that’s been plugged in by humans. Consider, for example, the automated spam filters that keep our inboxes free from annoying mass emails and save important messages. However, this is far from the kind of “general intelligence” humans possess, and which has been the goal of AI research for decades. And when it comes to building a superintelligent machine that can learn and act without the guiding hand of a human, it may still be decades away. But advancements in the field are happening quickly, so it could be upon us faster than we think. Such a machine would have a lot of power over our lives. Its intelligence could even be dangerous, since it would be too smart for us to disable in the event of an emergency. The history of machine intelligence over the past half decade has had its ups and downs. Superintelligence is likely to emerge in two different ways. 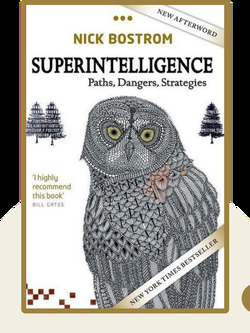 Superintelligence will either emerge quickly via strategic dominance or as a result of long collaborative efforts. We can prevent unintended catastrophes by programing superintelligence to learn human values. Intelligent machines will probably replace the entire human workforce. In the superintelligent future, the average human will be impoverished or reliant on investments; the rich will be buying new luxuries. Safety must be a top priority before superintelligence is developed. Start your free Blinkist trial to get unlimited access to key ideas from Superintelligence and over 3,000 other nonfiction titles. With bitesize text and audio, it's easier than ever to find the right ideas to transform your life.